Here at Shelving Design Systems, our knowledgeable staff has almost 150 years of combined industry experience designing and installing long-term care pharmacies and they are always ready to put those skills to work for your needs. We know what you do for your customers is important and we know what we do for you is too! Every long-term care pharmacy has a different set of needs in terms of pharmacy fixtures and their individual workflow processes. 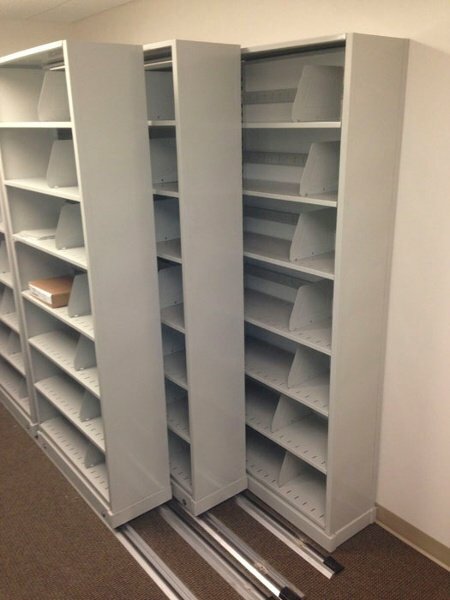 The team here at Shelving Design Systems works closely with each pharmacist to ensure each long-term care pharmacy has the proper amount of required space so that your current and future staff size are accommodated without need for retrofitting a short time down the road as your business grows. We take pride in being able to answer one of the most frequently asked questions in the industry: “what will work best for our space?”. Shelving Design Systems in-house installation services are uniquely suited to meet all your requirements. We are available to work around your schedule, on weekends or nights, to accommodate your needs. 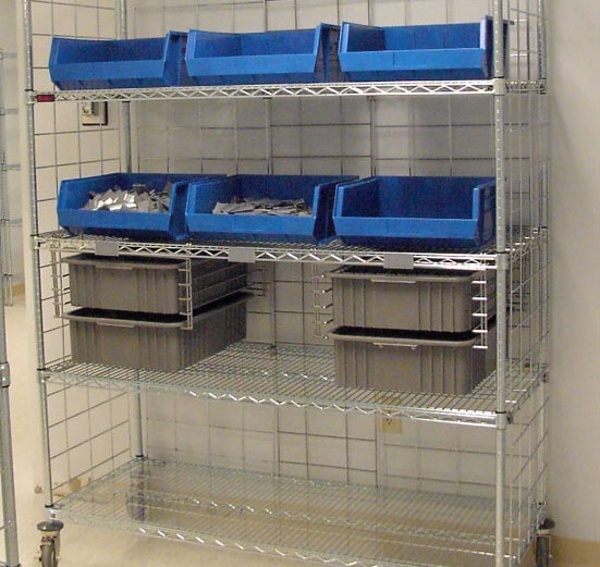 We use structured and strategic design solutions that have industry-proven for over 20 years, coupled with industry-specific adjustable shelving and specialized,custom designed work counters that are meant to provide maximum efficiency in your long-term care pharmacy facility. 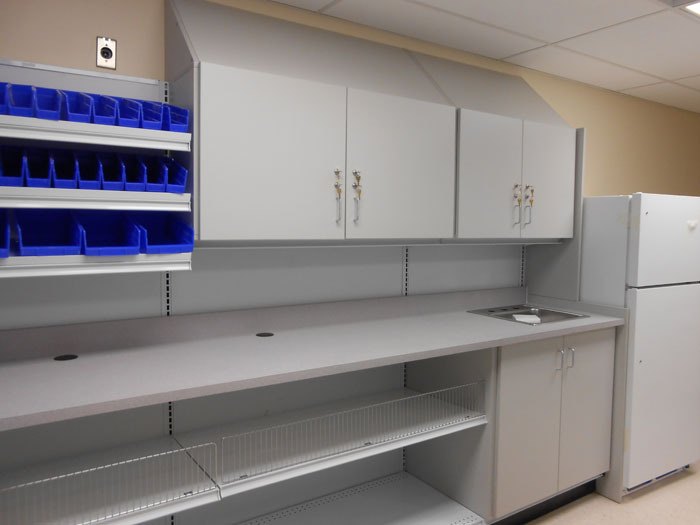 We have work stations that will work seamlessly with almost every type of robotic dispensing, pill counting, and compounding areas that long-term care pharmacies utilize. At Shelving Design Systems, we know that operating a long-term care pharmacy can be a challenging operation. We know building space comes at a premium, so we work hard to utilize as much of your square footage in the most efficient way possible. 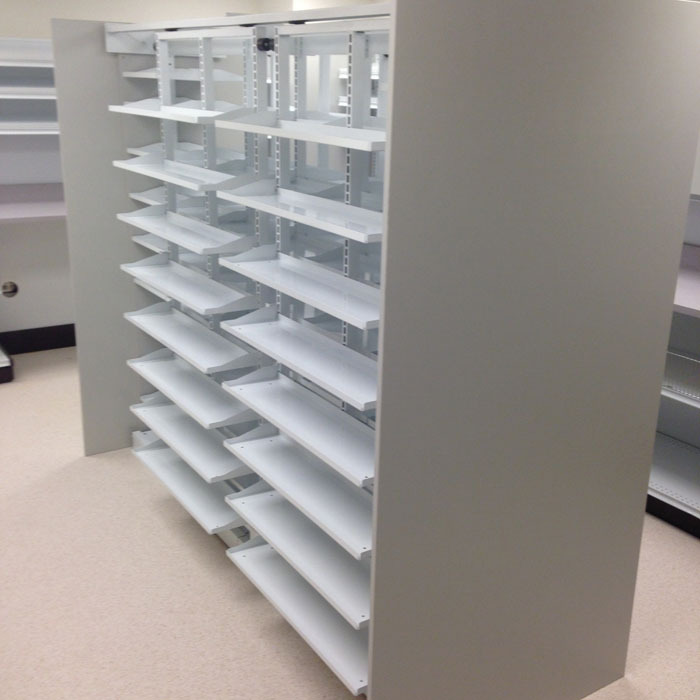 We take the guesswork out of your workflow problems, and will use the most innovative shelving systems to outfit your pharmacy space. We can take your existing empty space, new equipment, staff size, offices, break rooms, robots, even existing equipment and furniture and combine them to produce a design that meets your every need. 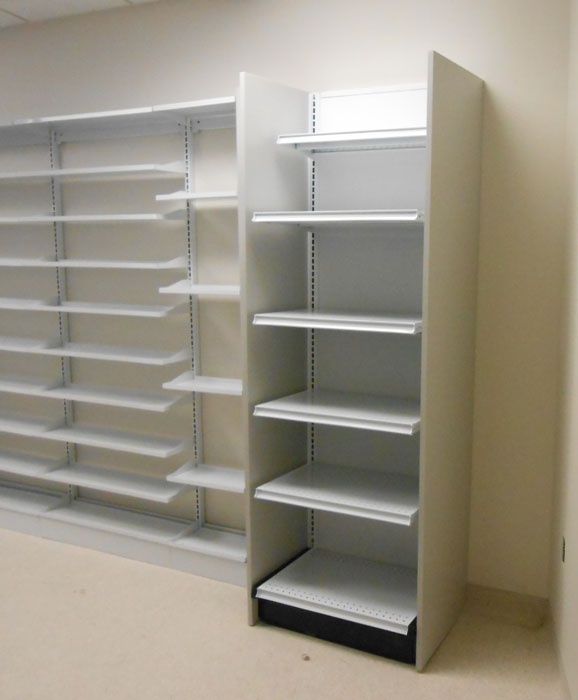 Shelving Design Systems can manage your project from start to finish, working with architects and contractors to eliminate any misunderstandings, while also providing elevations, suggested data/electrical plans, and help with your furniture and finish selections. We also provide you with innovative, photo realistic, 3D renderings of your pharmacy space. 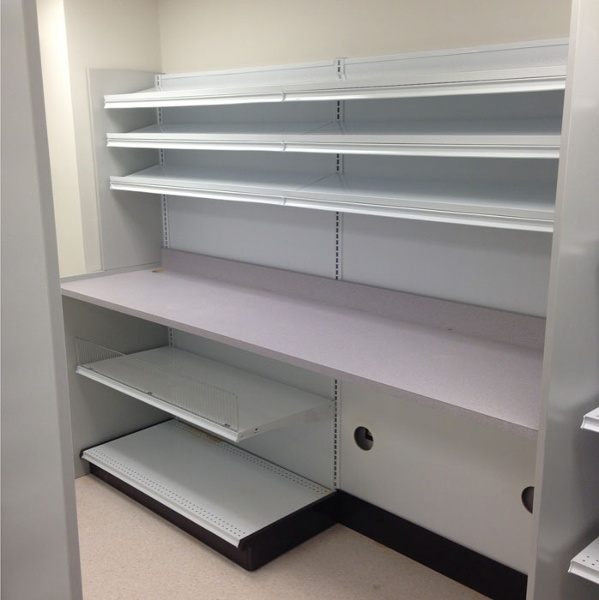 These images give you a snapshot view of what your pharmacy could look like. These images serve to help you better envision how your space will look before any final decisions are made. Shelving Design Systems would love to put our years of experience to work for you. 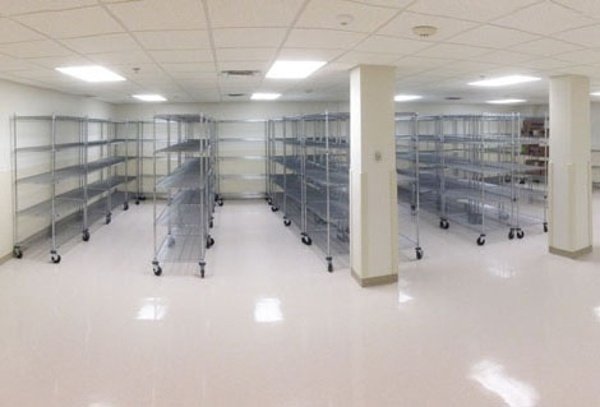 We are unmatched in the industry, and here to make your long-term care pharmacy project move smoothly and quickly! 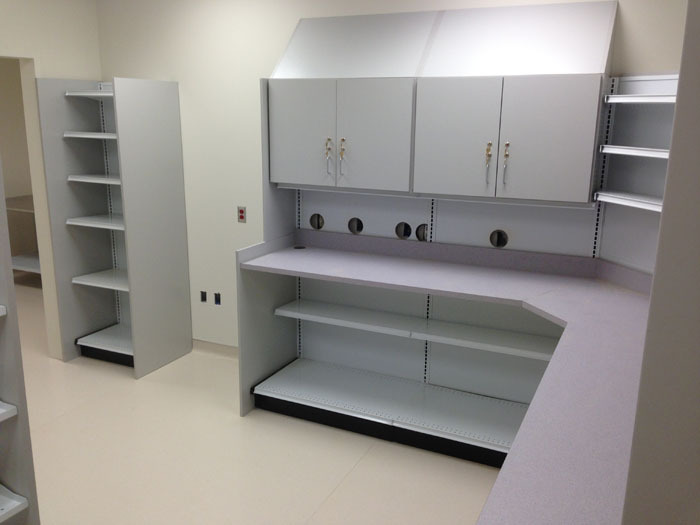 With a proven understanding of the science of pharmacy workflow, and the importance of reaching high standards of functionality, the Shelving Design Systems team ensures that your small space efficiently sustains the pharmacists’ freedom to work in a practical, clean and space-conscious pharmacy, confidently able to meet the needs of the physicians and patients depending on you.